Presence of a large number of small and large companies makes the global market for digestive enzymes competitive in nature. In order to grow in such a competitive environment, the established players are investing heavily in research and development to come up with better products. They are also embarking upon partnerships with retail chain companies to improve sales. Majorly boosting demand in the global market for digestive enzymes is the changing lifestyle of people world over and the subsequent shift away from healthy eating habits. Further, mushrooming fitness centers and gymnasiums, particularly in developing nations in Asia Pacific and Latin America, is also proving beneficial to the market. Acting as a deterrent to the global market for digestive enzymes, on the flipside, are substitutes for digestive enzyme supplements. Further, lack of knowledge about the exact dosage amounts also poses a challenge to the swift uptake of the products. 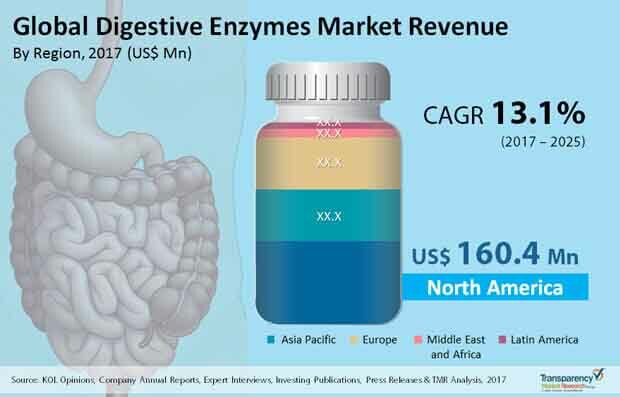 As per Transparency Market Research, the global market for digestive enzymes will likely expand at an impressive CAGR of 13.1% from 2017 to 2025 to become worth US$1,039.4 mn by 2025 from US$358.2 mn in 2016. The global market for digestive enzymes can be segmented based on different parameters. Based on origin, for example, the main segments of the market are plant, animal, and microbial. The segment of plant, among them, dominates the market with maximum share. This is because plant based enzymes possess broader pH range of the activity than the animal based ones. Plant based enzymes such as papain from papaya and bromelain from pineapple have proteolytic activity. In the years ahead, however, the segment of microbial is slated to register maximum growth because of the rising use of these species for production of enzymes, which in turn is on account of the fact that they are readily available. Depending upon the type of distribution channels again, the retail stores dominated the digestive enzymes market. The dominance of the segment has been brought about by the increasing number of retail stores worldwide and also because of the valuable information and guidance provided by pharmacists in such stores. In terms of growth rate, however, the online stores segment will emerge as the winner, predicts the TMR report. The convenience accorded by them will result in their rising popularity. Geographically, North America runs the show in the global digestive enzymes market at present. Pressing schedules and unhealthy eating habits of people, primarily in the U.S. is said to be driving the market in the region. In the near future too, the market in the region is predicted to retain its dominant share by rising at a CAGR of 12.8% from 2017 to 2025. Europe is another key market that has progressed on the back of a superior healthcare infrastructure and the high disposable income of its people. In terms of growth rate, however, Asia Pacific is slated to outpace all others with a CAGR of 13.9% in the forecast period, powered by nations of India and China. These densely populated fast-expanding large economies have a sizeable chunk of their population suffering from digestive disorders on account of fast-paced lifestyle which has resulted in untenable eating habits. This, in turn, has boosted demand for digestive enzyme supplements. Some of the prominent companies in the global market for digestive enzymes are National Enzyme Company, Country Life LLC., Garden Of Life Inc., Rainbow Light Nutritional Systems Inc., Food State Inc., Biotics Research Corporation, Metagenics, Inc., Matsun Nutrition, Twinlab Corporation, and Abbott Nutrition. This report provides in-depth region wise and country wise analysis of the digestive enzymes market. Stakeholders of this report include manufacturers, raw material suppliers, research institutes involve in the research of digestive enzymes and new players planning to enter the market. The report provides qualitative and quantitative analysis of the global digestive enzymes market. Qualitative analysis comprises market dynamics, trends, product overview, and country-level market information. Quantitative analysis includes major players with their reported revenue, market size, and forecast for the North America, Europe, Asia Pacific, Latin America and Middle East & Africa digestive enzymes market in major countries such as the U.S., Canada, Germany, Italy, France, United Kingdom, Japan, China, Brazil, and Saudi Arabia. Market revenue is provided in terms of US$ Mn from 2015 to 2025 along with the compound annual growth rate (CAGR %) from 2017 to 2025 for all the segments, considering 2016 as the base year. The executive summary of the report provides a snapshot of the digestive enzymes with information on leading segments, country wise market information with respect to the market size, growth rate (CAGR %), and growth factors. The market overview section comprises impact factors such as drivers, restraints, and opportunities for the global digestive enzymes market. These factors would aid the stakeholders in establishing a strong foothold in the global digestive enzymes market. Furthermore, the market overview section comprises key industry events, product overview, market attractiveness analysis and emerging trend in the digestive enzymes market. The market attractiveness analysis provides a graphical view comparing the growth and market dynamics in various segments and country wise to identify the most attractive market. The digestive enzymes market has been segmented as by origin, by application, by distribution channel and by geography. Based on origin, the market has been segmented into plant, animal, and microbial. Based on application, the market has been segmented into medical & infant nutrition, sports nutrition, and additional Supplements. Based on distribution channel, the market has been segmented into retail stores and online stores. Geographically, the digestive enzymes market has been categorized into North America, Europe, Asia Pacific, Latin America and Middle East & Africa. Moreover, analysis for the major countries comprising U.S. Canada, Germany, Italy, France, U.K., Rest of Europe, Japan , China, India, Australia, Rest of APAC, Brazil, Mexico, Rest of LATAM, Saudi Arabia and Rest of MEA have also been provided in the report. A detailed qualitative analysis of the factors responsible for driving and restraining the growth of the digestive enzymes market in various regions has been provided in this section. This report also includes various ups and downs about particular country or geography that has impacted the overall market globally. The report provides a detailed outline/blueprint of the digestive enzymes market globally that will assist new companies in establishing their presence and market players in expanding their market share in the market. The report concludes with the company profile section which includes company overview, financial overview, SWOT analysis, product portfolio, business strategies and recent developments for market players. The major players that profiled into the report includes National Enzyme Company, Garden Of Life Inc., Country Life LLC., Rainbow Light Nutritional Systems Inc., Food State Inc., Biotics Research Corporation, Metagenics, Inc., Twinlab Corporation, Abbott Nutrition, and Matsun Nutrition.